Song of a Jumping Bush Cricket (scroll down for explanation and additional recordings!). 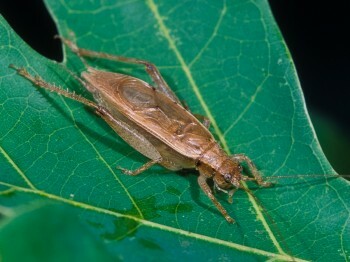 Often heard but seldom seen, the light brown Jumping Bush Cricket is a common inhabitant of rural and urban backyards. Named because it will jump when disturbed, the arboreal bush cricket has a unique flattened or compressed appearance. Males sing from vine covered tree trunks or dense herbaceous growth, as well as from the crowns of trees. A careful search of tree trunks at night may reveal one singing from a partially concealed perch. They are also fond of Boxwood plantings. Dozens of singing males might be found in a single bush. Vines that climb the walls of houses or fences is another favored haunt. Jumping Bush Crickets are on the move. They are expanding farther north with reports of singing being heard in Ithaca, NY. 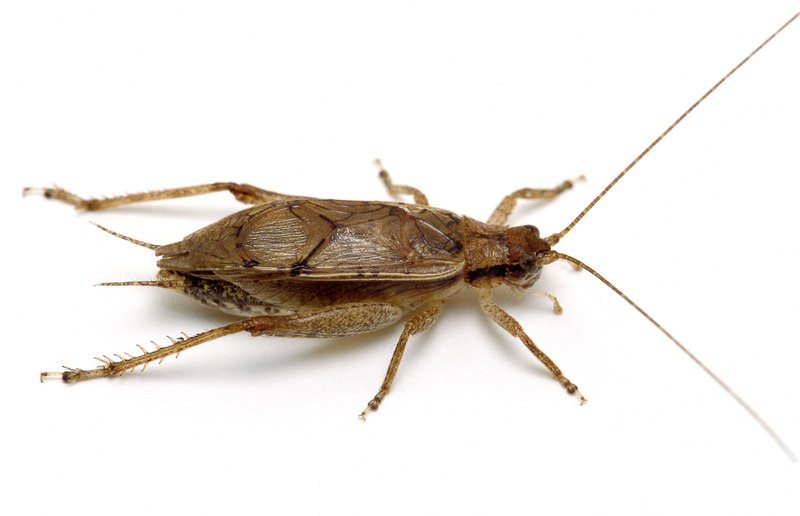 They are also expanding to the northeast along Lake Erie with reports of singing Jumping Bush Crickets being heard from Cleveland all the way to Erie, PA. No doubt, there are many locations in the northeastern U.S. where this species is now established. However, we do not have reports or records from those areas. As more data comes in, we will update the maps accordingly. Song: A clear, brief trill or chirp, repeated at the rate of one or two per second. Neighboring males often sing at slightly different pitches, perhaps making them easier for females to locate. In late August they can be heard singing as soon as the sun goes down. Later in the season, after the first frosts, males sing from less concealed perches and may even be found on the sides of buildings near plantings. The frequency of songs is about 5 kHz. Sonogram of a Jumping Bush Cricket. © Wil Hershberger.